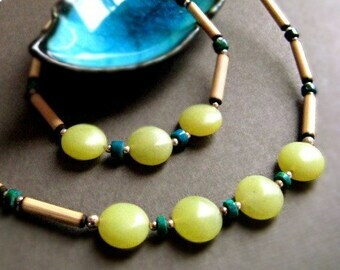 Handcrafted colorful necklace of Amazon seeds from the Amazon Rain Forest of South America. 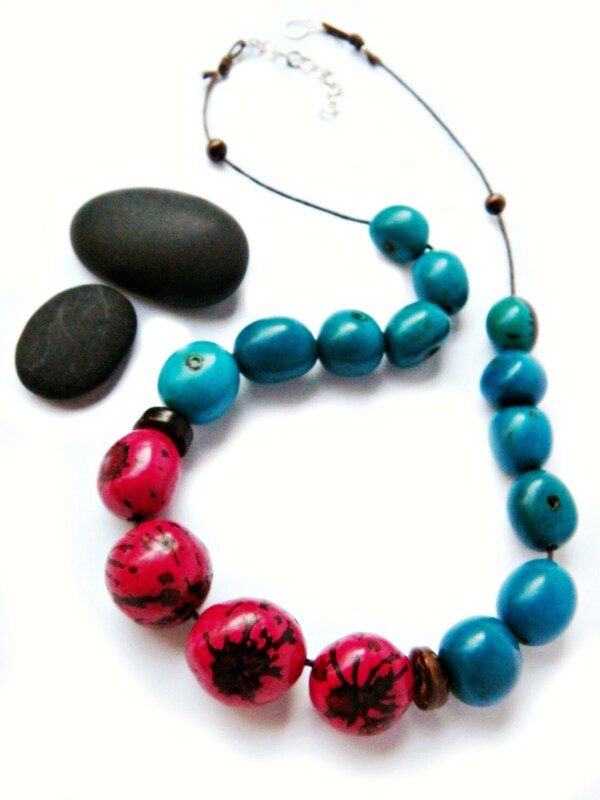 A grouping of Bombona Seeds from Ecuador in a vibrant berry color and contrasted with gorgeous sea blue, complemented with coconut discs and little brown wood beads at the end. All strung on to a brown cotton cord with sterling silver chain and a hand forged hook closure. A sterling silver hammered chain gives the necklace an adjustable length. The Amazon seeds are from South America and are natural materials, no two are a like. Their organic shape, lines, veins and niches are what makes them completely unique. 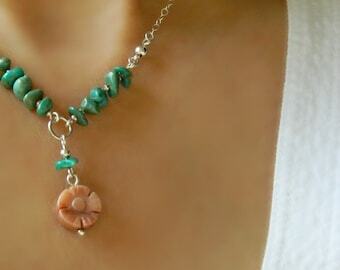 ♥ Your elegant Amazon seed necklace will arrive beautifully wrapped. ○ Amazon seeds are not only beautiful natural materials but are also eco-friendly. A sustainable and renewable resource that provides an alternative to rain forest destruction and gives additional economic resources to the native people of the rain forests of South America. All items are shipped from California by United States Postal Service First Class which takes approximately 3-5 business days for domestic mail and 10-21 business days for international. International mail can be subject to unexpected delays. Please be aware of your countries restrictions, duty taxes or custom fees. If you would prefer faster Priority shipping please contact me before making your purchase so I can adjust the shipping rate for your item before going through check out. Lovely necklace! Great quality. The hook clasp is a little small for these eyes but I'm very happy with the design. Beautiful, quality earrings! Thanks for customizing the ear wire gauge for me, they fit perfectly!! Fast shipping, too! If you will be using e-check, personal check or money order it will take approximately 3 - 5 days to be cleared by the bank before your purchase can be shipped. California residents are subject to 7.25% sales tax. If you are not happy with your order please contact me as soon as possible so we can discuss the options. You have up to 7 days after receiving your order and contacting me to return your item for a refund or exchange. Items must be in their original condition and box. Depending on the circumstance shipping may be non refundable then the buyer will be responsible for return shipping. I carefully wrap each order because it's important to me that my customer enjoys their purchase from the moment they receive their package. Orders are shipped out as soon as possible usually the next business day. All items are shipped by USPS ( United States Postal Service ) First Class Parcel with confirmation. If you would like a rush delivery or would like to purchase insurance please contact me for a quote. International orders : depending on the country packages can take any where from 1 to 3 weeks to arrive. If the package is held up in customs it may take longer. Buyers are responsible for any customs fees or taxes and shipping restrictions for your country. The Tagua Nut is also known as "vegetable ivory" and is indigenous to the rain forests of South America. The nut when it is dried resembles Ivory and can be carved into jewelry, buttons, and sculptural pieces. A sustainable and renewable resource, harvesting these nuts has little negative impact on the environment since it is the nut, and not the tree itself, that is used. Tagua is a renewable resource that furthers important environmental and socioeconomic goals by stimulating the local economies and micro enterprises in South America, providing an alternative to rain forest destruction and prevents elephants from being killed for their ivory tusks. Because of its incredible likeness to animal ivory, tagua is also being used as an ivory and bone substitute, so similar in fact, that it is being used for many museum and historical reproductions of elephant ivory artifacts. Sustainably harvested the Acai Palm Tree is not harmed in any way when harvesting the Acai berries. The actual berry is only about an inch in length and is similar in color to a blackberry. The berry contains a large seed the center. The actual seed is not only a beautiful natural material but is also an eco-friendly byproduct of the harvesting of the Acai fruit. Instead of simply discarding the seed it is repurposed into beautiful jewelry and provides additional economic resources for the native people of the rain forest. Sustainably harvested from the Huayruro plant that grows in the Amazon basin of the Peruvian rain forest. The bright colors and shiny surface are all part of the seeds natural appearance. A color combination of striking red and black give the seeds the look of a ladybug. Though the seed is not edible it has always been very desirable for its decorative quality and has long been used in Peruvian jewelry design. Huayruro seeds are very safe to wear as jewelry but are not edible, if chewed the seed can become toxic.